Head off to SM City Manila's #SMManilaTechieSALE this August 30, 31 and September 1 to avail of HUGE Savings on the latest gadgets. 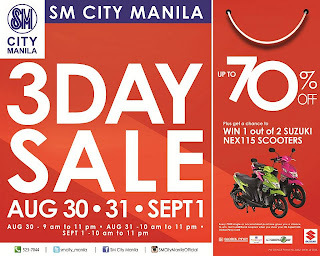 SM City Manila is also giving away NEX115 SUZUKI Scooters to two lucky shoppers! See you at the #SMManilaTechieSALE 3-day Sale!